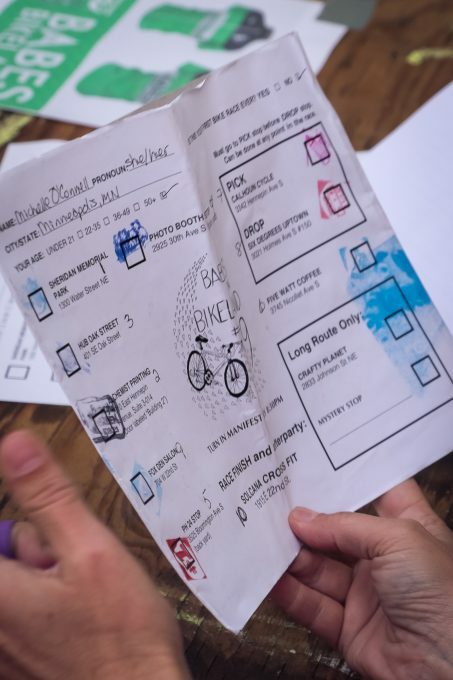 One of urban cycling subculture’s most interesting rituals is the alleycat: a bike race on open streets, where the riders choose their route between multiple checkpoints as outlined on a manifest. The competitions started as proof of skill among bicycle messengers, whose workday the events mimic. 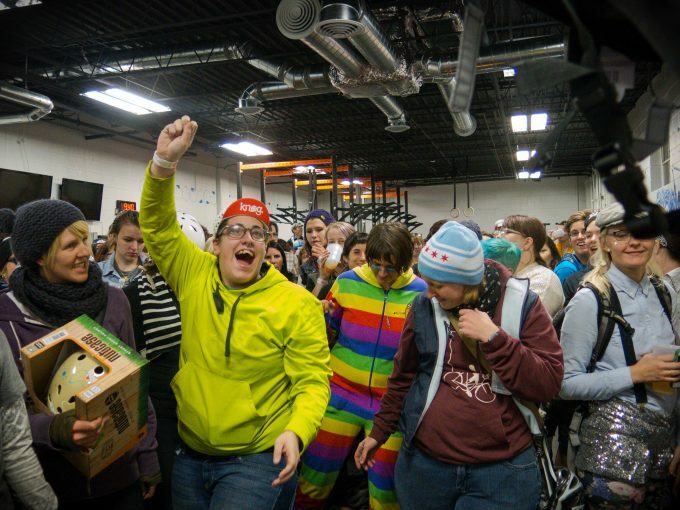 As bicycle messenger culture began to bleed into popular culture in the 1990s, leading to the new bicycle boom of the early 2000s, alleycat racing grew in popularity. Babes In Bikeland was created in 2007 by Kayla Dotson and Chelsea Strate, with the aim of providing a safe place for women to compete in this unique, generally male-dominated format of bicycle racing. Nine years later, with hundreds of annual participants, the event is a celebration of the women/trans/femme (in the event’s parlance, “WTF”) cyclists—and is a powerful tool for educating the cycling community about gender issues. 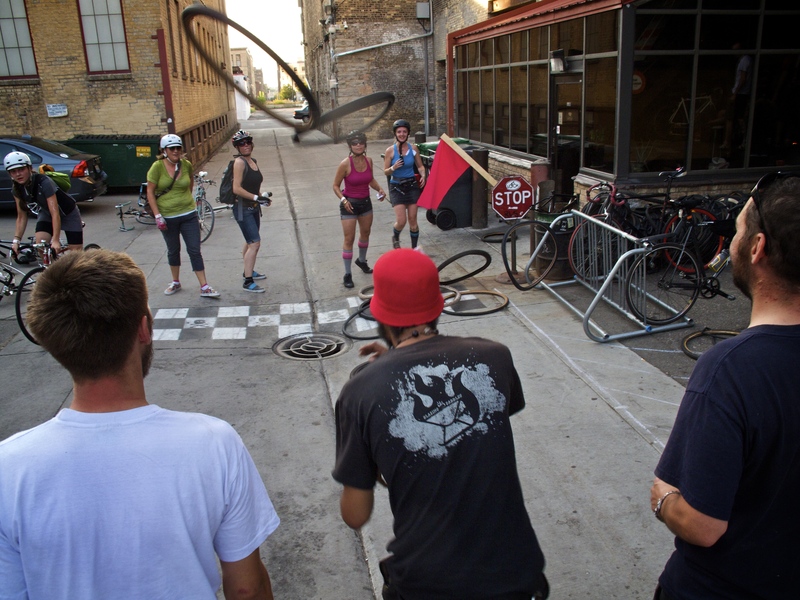 Minneapolis, Minnesota has long been a center of alleycat racing, playing host to one of the largest, longest-running of such events, the infamous Stupor Bowl, held each year since 1997 on the day before the American football event with a similar name. But alleycat racing and the culture surrounding it has been unwelcoming to WTF cyclists. 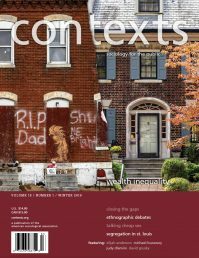 From lack of prize equity to harassment, stories of WTFs being shut out of such events abound. 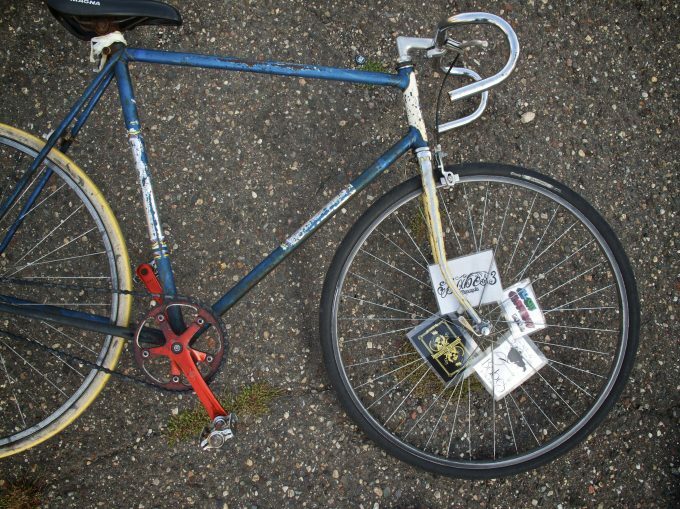 Alcohol, ego, and a no-rules attitude often lead to uncomfortable or even dangerous situations for these riders. At Babes In Bikeland, cisgendered males (men whose gender identity matches the gender they were assigned at birth) participate as volunteers at registration, running activities at checkpoints, or at the finish line. Each checkpoint has a captain, responsible for making sure that stop is a safe space. 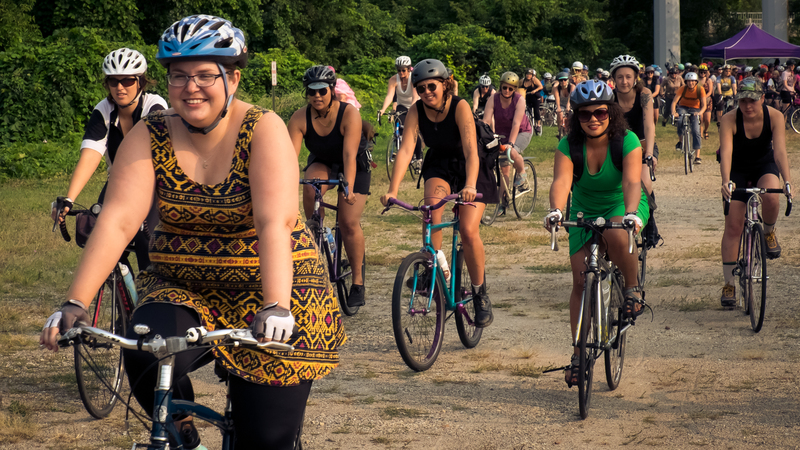 Riders, volunteers, and spectators are encouraged to know what a safe space is and feel empowered to enforce its boundaries, including no touching without both parties’ “enthusiastic consent” and no questioning whether a racer “belongs” in the race. During the awards ceremony, men are encouraged to get to the back of the room: WTFs to the front. 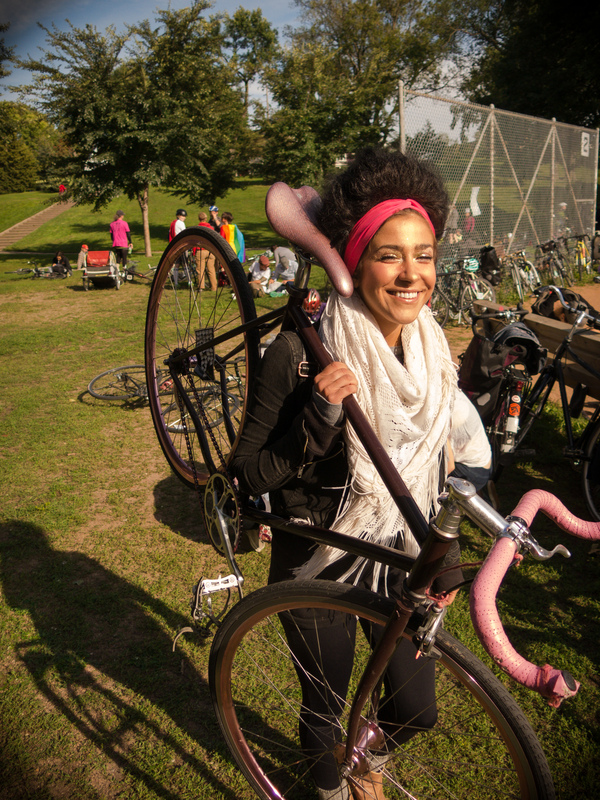 The annual Babes in Bikeland race, now nearly a decade old, attracts a diverse range of cycling community members as riders and volunteers. Some 500 “WTF” racers competed in 2015. 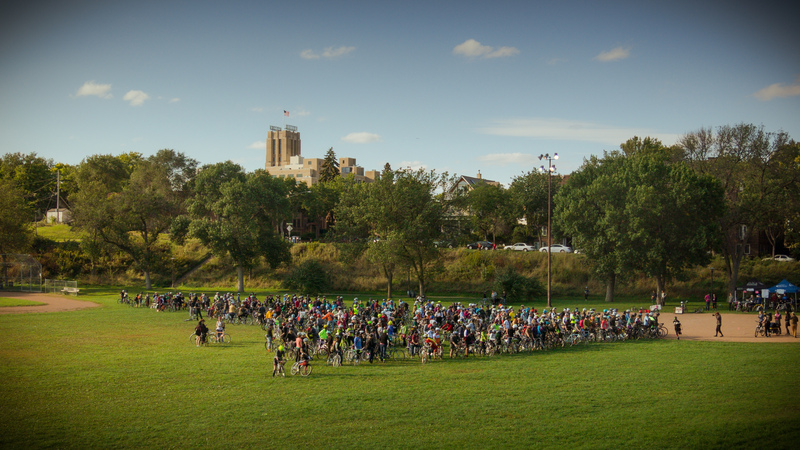 The 2014 event started in Powderhorn Park in South Minneapolis, with a rousing crowd of riders and volunteers. 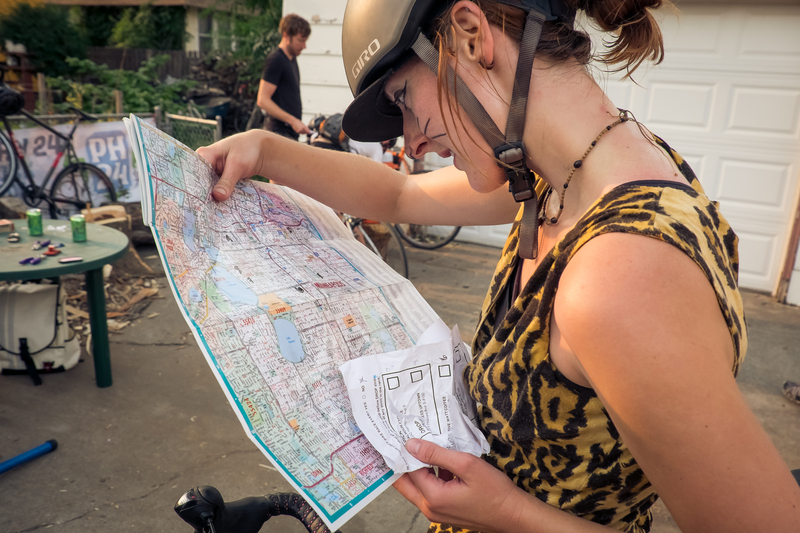 Planning an alleycat route often involves marking and consulting a map or writing a cue sheet. Riders receive their list of stops shortly before the race starts and have time to decide what they think is the best way to hit each location as quickly as possible. A rider makes last-minute adjustments to their bicycle. 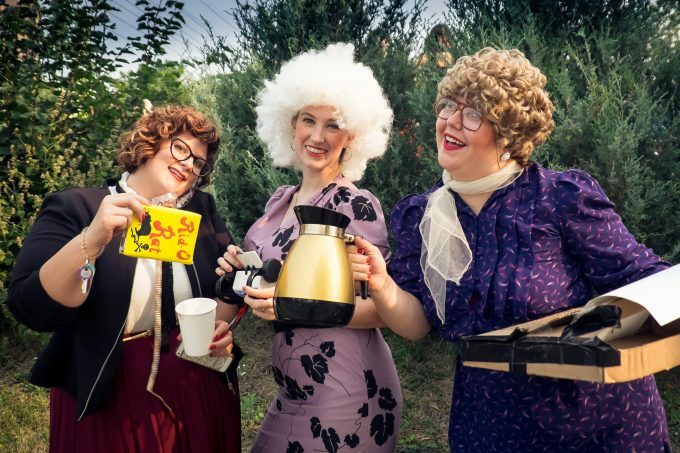 Competition, fun, and making a statement are all part of the event. 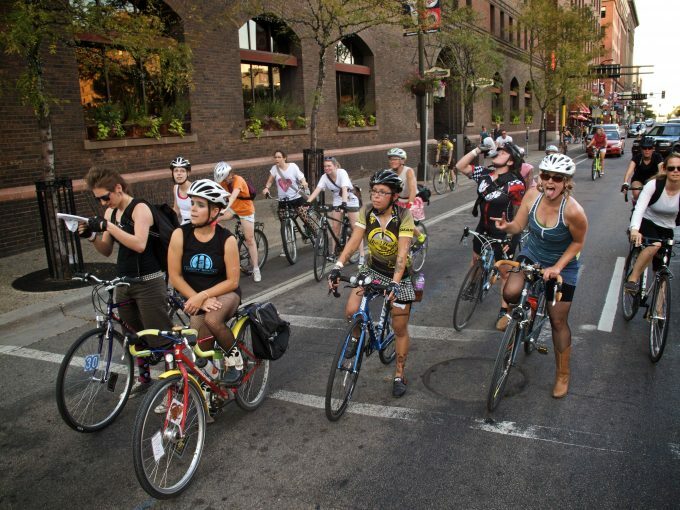 With the main event happening on open streets, riders travel to checkpoints around the city. Riders are competing and the prizes at Babes in Bikeland are often impressive—including bicycle frames and equipment as well as other goods from many enthusiastic local businesses. That said, the ride is more event than race for many participants. 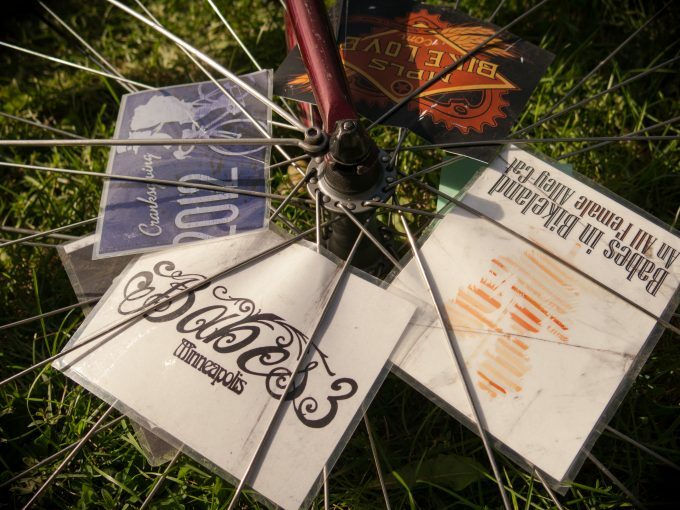 The traditional proof-of-participation for alleycat races, spoke cards are laminated art meant to be wedged between the spokes of a wheel. Riders often cherish their collections from past races. Riders wait for a signal at a downtown intersection. They are riding with the normal flow of Minneapolis traffic. A well-used street bike boasts a number of Babes in Bikeland and other spoke cards. 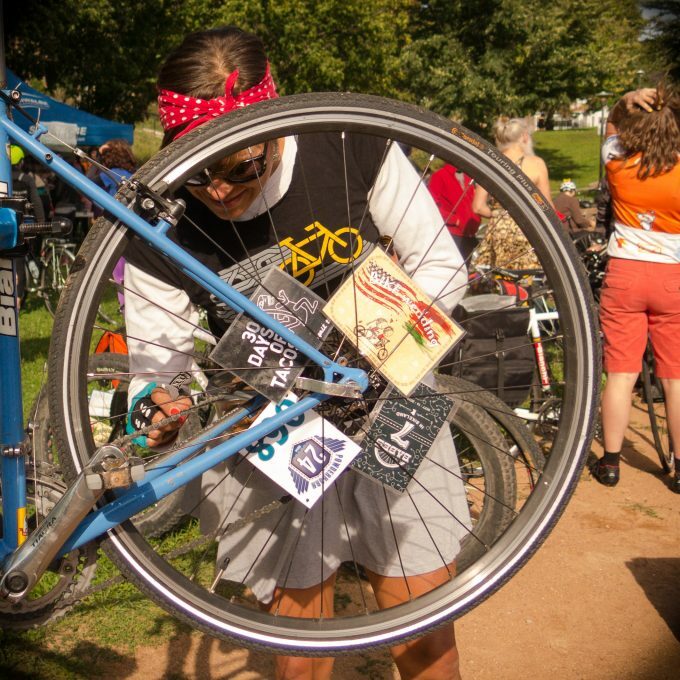 In addition to typical first, second, and third place prizes for the fastest racers, there are categories for new racers, riders from out of town, style, and others. All riders get a prize. 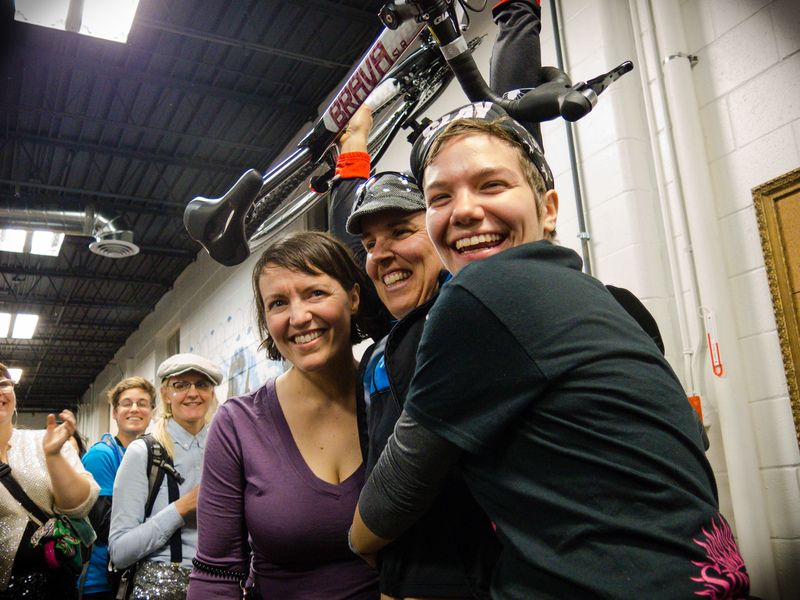 The top three veteran riders celebrate their win at the 2014 Babes in Bikeland after party. Bjorn Christianson is a photographer, designer, and developer in Minneapolis, MN. An avid cyclist, Christianson helps create, document, and promote many kinds of bicycle events each year.